Have your custom image projected onto any wall or dance floor. We are constantly asked for ways in which we can make our clients events more personable. With this in mind we are now able to supply a couple of different options for having your name or image of choice in lights! 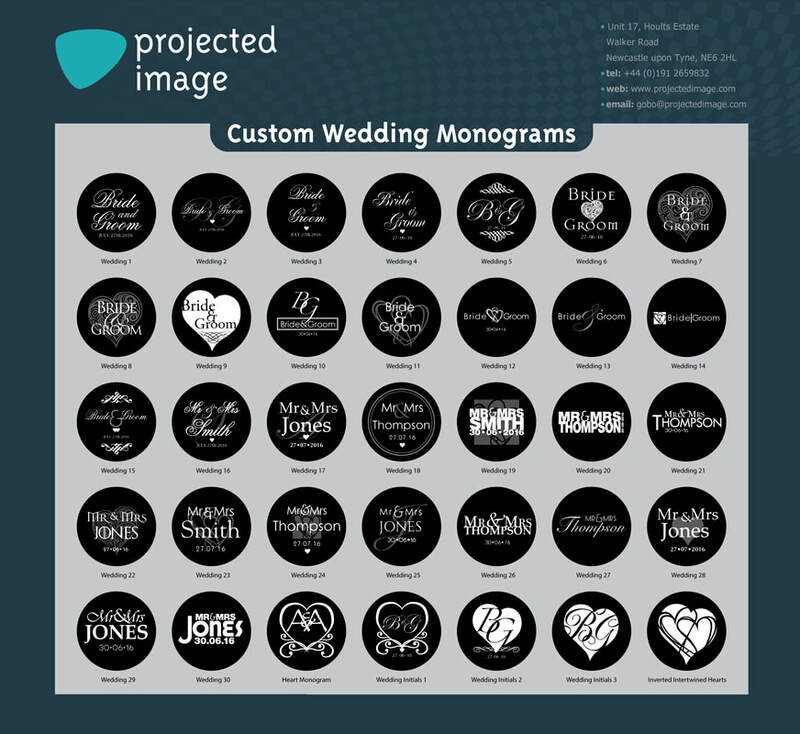 Many of our wedding or business clients decide to have their names as the image that is used for projection. We have in the past provided this service to corporate clients who have used their logo, or for theming purposes such as a 007 logo for a James Bond evening. 2: Do you want the image to move around the venue or can it be static? 3: How do you want the light to be mounted, T bar stand, truss podium or overhead trussing? To find out more about our image projection we would recommend that you call the office and one of the team will be more than happy to talk through your options with you. Prices start from £150.00 for a standard image. The cost for a personalised image (e.g. 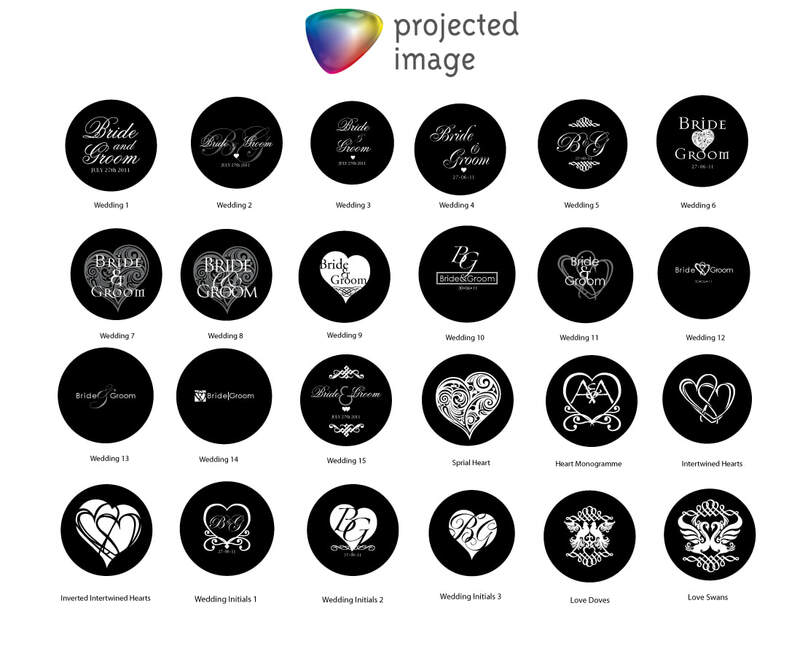 your names or logo) to be projected in a static location starts at: £200, this includes the set up cost of having your image manufactured onto a metal or glass disc to use in our lighting projectors. Delivery can be arranged at an additional cost. 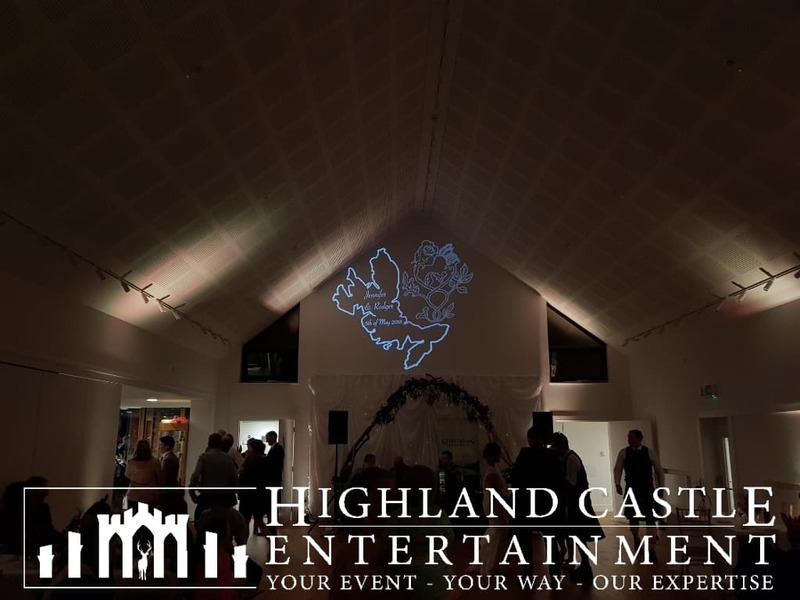 To find out more about our image projection service, or to book it for your wedding, exhibition or event, get in touch by either phone or email. Please see some of the custom designs we can create in the photos. The setting up for a projected image should take 10 - 20 minutes depending on power point access. We would set this up in the morning of the event if possible. This will be confirmed during booking. Yes, the projector will be powered by a normal socket. So all you will have to do is turn the socket on & off.